Bramley Grange and Kexmoor are part of Grewelthorpe, see history section of this web site. Thanks to Martin Briscoe for some of this information. Martin would like to hear from any descendants of Edward Harrison  of Grantley & also John Hammond of Canada. See Hammond family details. Jennifer Treadwell would like to hear from anyone with information about Thomas Dalton Harrison [1817-1874] & his wife Elizabeth McRobb. Joyce Harrison is seeking information about the Harrisons from Winksley. I am researching the George Harrison (1821 born Winksley) family from Winksley. George Harrison married a Sarah (born 1827 Laverton) who I think might be a Clark but I can find no details of Sarah’s parentage. Any information would be gratefully received. Most of their children, including Clark Harrison are shown on this site. Thanks to Alys Jones who sent information about John & Isabella Calvert. Todd Harrison sent the following request Nov. 2011. Specifically, I am interested in contacting the living Harrison’s in the Yorkshire area to exchange additional information about Harrison family history. Lexington KY 40502 allen daniel is seeking information. Received Oct. 2012. I am trying to find information on William Ianson Harrison and Lilie Waite they adopted a son called Cecil who married Shirly I married his daughter Brenda we are trying to find more about the adoption as we can’t find any record of it or no birth certificate and believe they were in Grewelthorpe parish at the time. If you can help Allen please contact him. ABIGAIL HARRISON. Married on 28.11.1797 at Kirkby Malzeard to William Nicholson. a Husbandman. ALICE HARRISON. Born C. 1866 in Carlton in Coverdale. Buried 3.3.1943. M.I. dau of Thomas & Elizabeth from Masham. In 1911 living unmarried with her widowed Mother in Grewelthorpe. ALICE HARRISON. Born 3 Sept. 1888. A house parlour maid living Ripon in 1939. Unmarried. ALICE M. HARRISON. Born 21 Dec 1916. Dau of John W. & Lucy E. In 1939 she was twister and twine worker. Later married ? Smith. ANTHONY HARRISON. Born C. 1792. in Staveley. Bootmaker [1851C] Husband of Mary. ANN HARRISON. Born C. 1780. Living with Thomas & John Harrison on 1841 census. ANN HARRISON. Bap. 14.1.1845 Kirkby Malzeard. Died 1874 Keighley. Dau of Edward [The Innkeeper]& Jane Thompson. Married to James Tillotson of Lancashire. Mother of Edward  & Jane . ANN HARRISON. Bap. 13.10.1849 Kirkby Malzeard. Dau of William [the Blacksmith] & Margaret. Married on 10.4.1871 at Kirkby Malzeard church to David Kilburn. [b.1849] son of James Kilburn. David was a Labourer in Bradford when he married. ANN HARRISON. Born C.1850. Dau of Thomas & Jane. ANNIE HARRISON. Born C.1879 Ripon. Dau of Edward & Ann I. Grainger. ARABELLA HARRISON. Born C. 1757. Buried 3.3.1818. Kirkby Malzeard. ARTHUR HARRISON. Bap. 19.7.1931 Mickley. Son of James Francis William the Gardener & Mary Ellen. CHARLES HARRISON. Born 1829 Carlton, Coverdale. Son of Henry & Mary Ann. CLARK HARRISON. Born C. 1860 Winksley. Son of George [Bobbin Turner] & Sarah. CONSTANCE AMY HARRISON. Born 7.8.1921. Bap. 22.12.1921. dau of Fred & Sarah Mary Elizabeth. Father Police constable in Wombwell. EDITH HARRISON. Born 1889 St.Helens Lancs. Dau of Henry B. & Elizabeth Crossley. EDWARD HARRISON. Born C. 1820 Grantley. Died 1880 Ripon. Husband of Jane Thompson. Married 1841 Bedale. EDWARD HARRISON. Born C. 1849. Buried 18.3.1849 infant. Grewelthorpe. [Ref. Par.Reg]. EDWARD HARRISON. Bap. 14.3.1849 Kirkby Malzeard. Son of Edward [The Butcher] & Jane of Grewelthorpe. Husband of Ann Isabel Grainger of Bishop Monkton. Married 1878 Ripon. EDWARD HARRISON. Born C. 1859. Son of John [Farmer] & Isabella Calvert. EDWARD HARRISON. Born C.1880 Ripon. Son of Edward & Ann I.Grainger. ELIZA HARRISON. Born C. 1832. Dau of Anthony & Mary. Father a bootmaker. ELIZABETH HARRISON. Born C.1817 Leeds. Dau of Mary of Pateley Bridge. Living Winksley unmarried 1861. ELIZABETH HARRISON. Born C.1826 Horsehouse, Coverdale. Buried 18.9.1913 M.I. Wife of Thomas. 1911 a widow living with dau. Alice in Grewelthorpe. ELIZABETH HARRISON. Bap. 1.5.1851 Mickley. Dau of John the Flax dresser & Jane of Mickley. ELIZABETH HARRISON. Born C. 1856. Dau of John [Farmer] & Isabella Calvert. ELIZABETH HARRISON. Born C. 1862 Masham. Dau of Robert. Living Quarry House, Ilton in 1891. EMILY ELIZA HARRISON. Born C1825. Buried Mickley 27.11.1915. Lived High Bank, Mickley. EMILY HARRISON. Born C. 1864. Dau of John [Farmer] & Isabella Calvert. EMMA HARRISON. Born C.1851 Monty Frystone Yorkshire. Wife of John. ERNEST R.W.HARRISON. Born C1850 Upton. Son of Thomas Dalton Harrison & Elizabeth McRobb. ERNEST HARRISON. Born C.1877 Lancs. Son of Henry B. & Sarah Slater. ETHEL M.HARRISON. Born C.1883.Bradford. dau of John & Emma. FLORENCE HARRISON. Born C. 1886 St.Helens . Lancs. Dau of Henry B & Elizabeth Crossley. FLORENCE [FLORRIE] HARRISON. Bap 19.5.1889 dau of William & Jane Metcalfe. Farmer Bramley Grange. 1911. doing dairy work at parents farm. unmarried. FRANCES ELIZABETH HARRISON. Born C.1787. Buried 8.1.1875 Mickley. FRANCIS F. HARRISON. * Born C. 1851 Kirkby Malzeard. Son of William [Blacksmith] & Margaret. Married to Jane of Norton le Clay. FRANCES GEORGIANA HARRISON. Born C1848 Mickley. Unmarried in 1911. Dau of Thomas Dalton Harrison [clergyman] & Elizabeth McRobb. of Canada. Living Mickley Parsonage in 1861. GEORGE HARRISON. Born C. 1748. Lived Winksley. Buried 18.5.1836 Kirkby Malzeard. GEORGE FRANCIS HARRISON. Born C. 1818. Buried 28.7.1852 Mickley. GEORGE HARRISON. Born C.1821 Winksley. A Bobbin Turner. married to Sarah from Laverton. GEORGE HARRISON. Born C 1854. Son of John [Farmer] & Isabella Calvert. GEORGE HARRISON. Born 12 May 1874. In 1895 Married to Lily Waddington. [born 1875]. Nightwatchman in Ripon 1939. GEORGE PRESCOTT HARRISON. Born 1884 Mickley. Buried 3.5.1884. Infant. Lived Tanfield Lodge. GEORGE HARRISON. Served in WW2 in Royal Artillary. Name on church honours board. GEORGE R. HARRISON. Born 19 Feb. 1924. Son of William & Anne. of Oak Cottage. He was a gravedigger in 1939. HANNAH HARRISON. Born C.1859. Carlton in Coverdsale. Dau of Thomas & Elizabeth. HANNAH HARRISON. of Bramley Grange. Married Peter Carter Verity of Wathermarske, Masham. Banns read August 1882. HARRY HARRISON. Bap 28.9.1859 son of Thomas Hanley Harrison & Jane. Farmer from Halifax. Harry was a dom.gardener in Ripon 1901. Husband of Mary from Durham. HARRIET HARRISON. Dau of David of Ramsgill. Married on 19.8.1852 at Kirkby Malzeard church to Hiram Watson. a Joiner from Ramsgill, son of John Watson [Joiner]. Witnesses Thomas & Grace Watson. HELEN A. JANE HARRISON. Born C. 1890 Ripon. Dau of Edward & Ann I.Grainger. HENRY HARRISON. Born 21 June 1781 Yafforth. Died 1839 Masham. Son of Thomas & Jane Hanley. In 1811 married Ann Steward of West Tanfield. HENRY HARRISON. Born C. 1805 Carlton, Coverdale. Died C. 1867 Bramley. Husband of Mary Ann of Carlton. HENRY HARRISON. Born C. 1822 Kirkby Malzeard. A Sawyer. Married to Mary from Winksley.[b.1826]. HENRY AISLABIE HARRISON. Bap 25.4.1824 son of Robert & Elizabeth of Lindricks. HENRY HARRISON. Born C. 1831 Kirkby Malzeard. Son of William & Jane. Unmarried in 1861 in Kirkby malzeard. HENRY HARRISON. Born 1837 Carlton, Coverdale. Son of Henry & Mary Ann. HENRY BARKER HARRISON. Bap.14.8.1853 Kirkby Malzeard. Cotton Twister & Scripture reader. Son of Robert Cundall Harrison [A Jobber] & Margaret Barker. Married  Sarah Slater. in 1872 in Manchester, Had 2 children Robt Levi 1872 & Ernest 1877. Married  Elizabeth Crossley. 2 children. Florence 1886 & Edith 1889 in St Helens Lancs. HENRY HARRISON. Born Jan 25 1925. Son of Thomas & Mary of the Nook Grewelthorpe. Husband of Lena Burrill. dau of Leonard Burrill. HERBERT E. HARRISON. Born 10 Sept 1919. A wood machinist living Low Laithe in 1939. ISABELL HARRISON. Bap. 27.4.1603 Ripon Cathedral. Dau of David Harrison a pauper. ISABEL HARRISON. Bap 25.9.1764 dau of Christopher. ISABELLA HARRISON [Nee CALVERT.] Born C. 1824. Skellgill. Died 1914. Dau of William & Ann of Laverton. married John Harrison in 1846. Had 10 children. JACK HARRISON. Was the leader of the Masham Bell ringers. Recalled that formerley it was the custom to ring the church bells on the eve of the September Fairs in Masham, the object being to guide by the sound of the bells, persons coming across the wide moors, which were open and unenclosed. Ref. Masham History 1865. JAMES HARRISON. Born 1798 Kirkby Malzeard. Died 1855 Kirkby Malzeard. Son of John. Labourer & Farmer. Married Sarah Cundall. 26.4.1823 Kirkby Malzeard. Lived Town St. K.Malzeard 1851. Had 8 children. JAMES HARRISON. Born 1831 Sugar Hill, Kirkby Malzeard. Buried 25.7.1852 Kirkby Malzeard. Tailors Apprentice. Son of James & Sarah Cundall. JAMES HARRISON. Bap.29.3.1846. Son of John [farmer]& Isabella Calvert. of Dallowgill. JAMES HARRISON. 1890 Farmer at North Cote, Masham. Ref. Bulmer’s 1890 Directory. JAMES HARRISON. Born 21 Aug.1900. Married to Mabel [born 1899]. Farmer living Ringbeck 1939. JANE HARRISON. Born C1817. Buried Mickley 5.11.1891. JANE HARRISON nee THOMPSON. Born C.1818 Masham. Died 1885 Ripon. Wife of Edward. JANE HARRISON. Born C.1818 a widow in 1891 living in Ripon. JANE HARRISON. Born C.1836 dau of Anthony & Mary. JANE HARRISON. Born C. 1839 Carlton, Coverdale. Sister of Margaret & William. JANE HARRISON [nee Metcalfe]. Born C.1865 Ilton. Buried 9.11.1941. Wife of William of Bramley Grange. M.I. JANE HARRISON. Born C. 1870. Grewelthorpe. Living Ripon in 1891. JANE ANN HARRISON. Born C1871 Easingwold. Dau of Joseph & Hannah. JANE HARRISON. Born in Durham. Married William Jackson. in 1891. Banns read at Grewelthorpe. JAPHET HARRISON. Born C.1854 Winksley. Son of George [Bobbin Turner] & Sarah. JEREMIAH HARRISON. Born C 1807 Carlton, Coverdale. Husband of Martha of Coverdale. JOHN HARRISON. Born C1734. Died 19.6.1808 Masham. Former purser in Royal Navy. Had sister Phillis. JOHN HARRISON. Born C. 1766. Buried 7.11.1838 Kirkby Malzeard. JOHN WALKER HARRISON. Born C.1789. Buried 12.12.1857 Mickley. JOHN HARRISON. Born C. 1817. Buried 20.7.1842 Kirkby Malzeard. JOHN HARRISON. Bap. 25.2.1821 Aldfield. Son f Robert & Elizabeth of Lindricks. JOHN HARRISON. Born c1823 Laverton. Son of James & Sarah Cundall. JOHN HARRISON. Son of George a miller at Darley. John was a Miller also. He married Ann Wilkinson. of Galphay, dau of Thomas, on 26.12.1840 at Kirkby Malzeard. JOHN HARRISON. Born C.1824 Masham. buried 28.3.1882. from Kirkby Malzeard. JOHN HARRISON. 1822 [directory]Blacksmith in Kirkby Malzeard. Died 1838 in K.Malzeard. Father of Joseph the Blacksmith. JOHN HARRISON. Born C. 1824. Lived Stainmore. Buried 17.9.1840 Kirkby Malzeard. JOHN HARRISON. Born C. 1824 at Masham. Farmer Spring Hall Grewelthorpe. Report in Yorkshire Gazette June 1854. At a recent Sheep Fair in Ripon, Mr John Harrison of Spring Hall, Grewelthorpe, exhibited 6 shearling wethers – a crop between the Shropshire down and a Cotswold tup. The average weight was about 28lbs per quarter. The finest which was slaughtered by Mr Wood of Kirkby Malzeard, weighed over 30lbs per quarter. JOHN HARRISON. Born C. 1826. Grantley. Died 1899/1900.Son of John [Farmer] & Mary. Married Isabella Calvert. [b.1824- d.1914] on 5.3.1846 at Ripon Registry Office. They had 10 children. Lived Grantley. JOHN HARRISON. Born C.1839 Winksley. Bobbin Turner. Son of Joseph [stonemason] & mary. JOHN CUNDALL HARRISON. Born 1841 Stainmoor, Kirkby Malzeard. Died/ Buried 12.2.1870 Kirkby Malzeard. Wesleyan Minister. Son of James & Sarah Cundall. Married Mary Eliza Tanfield. on 8.8.1866 Ripon Meth. Church. JOHN HARRISON. Bap. 30.11.1845 Kirkby Malzeard. Son of William [The Blacksmith] & Margaret. Blacksmith in Kirkby Malzeard 1891. JOHN HARRISON. Bap.21.3.1847. Kirkby Malzeard. Son of Edward [The Publican] & Jane. of Grewelthorpe. Husband of Emma. JOHN HARRISON. Born C. 1852. Son of John [Farmer] & Isabella Calvert. JOHN HARRISON. Born C. 1852. Son of Thomas & Jane. JOHN HARRISON. Born C. 1854 Winksley. Son of George [Bobbin Turner] & Sarah. JOHN HERBERT HARRISON. Bap. 30.7.1855 Kirkby Malzeard. Cloth Worker. Son of Robert [The jobber] & Margaret. JOHN W. HARRISON. Born 13 Dec 1882. Married to Lucy E. [born 1889]. Living Low Laithe in 1939. JOHN W. HARRISON. Born 24 Sept 1883. Married to Ellen [born 1889]. He was a chauffeur living at Red House Lodge Ripon in 1939. JOHN E.HARRISON. Born C. 1884 Bradford. Son of John & Emma. JOSEPH HARRISON. Born C.1800 Pateley Bridge. Stonemason. married to Mary born Grewelthorpe 1808. JOSEPH HARRISON. 1822[directory] Blacksmith in Kirkby Malzeard. Died 1860 Kirkby Malzeard. Son of John the Blacksmith. JOSEPH HARRISON. Bap. 2.8.1825 Aldfield. Son of Robert & Elizabeth. JOSEPH HARRISON. Born 1837 Stainmoor. Died 1883-91. Son of James & Sarah Cundall. Cattle dealer and later Tailor. Married Hannah. 2 children Sarah 1870 & Jane 1871. After marriage lived at Nags Head Inn Easingwold. JOSEPH HARRISON. Born C.1851 Winksley. Son of George [Bobbin Turner] & Sarah. JOSEPH HARRISON. Born C1890 Kirkby Malzeard. Son of Francis [blacksmith] & Jane. JOSEPH HARRISON. Born 3 June 1912. In 1939 a Labourer at Greenas Farm Galphay. JUNE HARRISON. Born 12 Nov 1864. A widow living Cross Hills Grewelthorpe in 1939. KATHLEEN BEATRICE HARRISON. Bap 19.10.1919 dau of Fred & Sarah Mary Eliz. Police Insp. Barnsley. KENNETH HARRISON. Born 18 June 192?. Son of William [blacksmith] & Doris. LEONARD W. HARRISON. Born 22 March 1915. Married in 1939 to Zena Wilson. [born 1914]. A police constable in Ripon in 1939. LENA HARRISON [nee BURRILL]. Born C.1926. Buried 9.10.1964. Dau. of Leonard Burrill. Wife of Henry. Lived The Nook.Grewelthorpe. M.I. LILIAN HARRISON. Born C1888 Kirkby Malzeard. Dau of Francis [blacksmith] & Jane. LUCE HARRISON. Buried 29.1.1732 Kirkby Malzeard. Dau of William of Mickley. MAGGIE ELIZABETH HARRISON. Born C.1863 dau of William the Blacksmith. Married on 5.12.1885 at Kirkby Malzeard church to John Caygill. [b.1862] son of James Caygill. Gardener. MARGARET HARRISON. Born C. 1767. Lived Willow House. Buried 16.3.1820. Ref. Kirkby Malzeard Par. reg. MARGARET HARRISON [Nee ?]. Born C.1823 Kirkby Malzeard. Widowed in 1891. She was Mistress of Blacksmith business. 2 of her sons were Blacksmiths. MARGARET HARRISON. Born C.1836 Carlton, Covedale. Sister of William & Jane. MARGARET HARRISON. Born C1848. Dau of John [Farmer] & Isabella Calvert. MARGARET HARRISON. Born 1857 Kirkby Malzeard.Cotton weaver. Dau of Robert Cundall Harrison & Margaret Barker. Lived Oldham in 1881. MARGARET ELIZABETH FRANKLAND HARRISON. Bap. 18.10.1863 Kirkby Malzeard. Dau of William [Blacksmith] & Margaret of Kirkby Malzeard. MARGARET HARRISON. Dau of Thomas of The Nook, Grewelthorpe. Sister of William & Henry Harrison. MARGARET HARRISON. Youngest dau. of Thomas of Ivy House, Grewelthorpe. Married Brian W. Stockill. of Markington on 16 May 1958. MARIA HARRISON. Born C1831. Dau of Joseph the Blacksmith. Married on 5.6.1854 at Kirkby Malzeard church to Henry Wood. son of William Wood [Besom maker]. MARIA HARRISON. Born C. 1844 Carlton, Coverdale. Dau of Henry & Mary Ann. MARIA HARRISON. Born 1859 Kirkby Malzeard. Cotton weaver. Dau of Robert Cundall harrison & Margaret Barker. Lived Oldham 1881. MARY HARRISON. Born C. 1787 Pateley Bridge. pauper in Winksley in 1861. with daughter Elizabeth. MARY HARRISON. Born C. 1799. Wife of Anthony the Bootmaker. MARY ANN HARRISON. Born 1807 Coverdale. Died after 1871. Wife of Henry born C. 1805. MARY HARRISON. Bap. 21.4.1822 Aldfield. Dau of Robert & Elizabeth of Lindricks. MARY HARRISON. Dau of Joseph the Blacksmith of Kirkby Malzeard. She married John Pickersgill. son of Simon of Galphay. on 1.10.1842 at Kirkby Malzeard. Witness Henry Harrison. MARY HARRISON. Born C. 1834 Kirkby Malzeard. Dau of James & Sarah Cundall. Bonnett Maker, Town St. K.Malzeard in 1851. MARY HARRISON. Born C. 1837. in Coverdale. Wife of Matthias. Farmer Kexmoor. MARY JANE HARRISON. Born C. 1843 Grantley. Dau of Edward & Jane. Wife of John Hammond of Canada. see Hammond page. MARY ELIZA HARRISON [Nee Tanfield]. Born 1843 dau of John Tanfield & Rebecca Cundall. Married John Cundall Harrison in 1866. MARY HARRISON. Bap. 15.8.1846 at Kirkby Malzeard. Son of Thomas [The Yeoman] & Jane of Grewelthorpe. MARY HARRISON. Bap. 13.7.1856 Kirkby Malzeard. Dau of William [The Blacksmith] & Margaret. MARY HARRISON. Born C.1858 Winksley. Dau of George [Bobbin Maker] & Sarah. MARY HARRISON. Born C.1860 Durham. Wife of Harry the Gardener. Living Ripon 1901. MARY HARRISON. Born C. 1862. Dau of John [Farmer] & Isabella Calvert. MARY ELIZABETH HARRISON [nee?] Born 1876. Wife of Richard. Lived Cross Hills Grewelthorpe. Died Warren Lane Galphay age 76 on 7 Feb 1952. MARY HARRISON. Born C.1893. Buried 4.12.1961. Wife of Thomas. lived Ivy House, Grewelthorpe. M.I. MARY OLIVE HARRISON. Bap 14.9.1913 dau of Fred & Sarah Mary Elizabeth. Police constable Bingley. MATTHIAS HARRISON. Born 1837 in Coverdale. Son of William & Alice. Husband of Mary. Farmer Kexmoor. Lived Gill Head Farm, Swinton 1901. In 1911 a widower living in Grewelthorpe with housekeeper Emma Purnill. MILLICENT HARRISON. Born C. 1900. Wathermarske. Dau of William & Louise. PHILLIS HARRISON. Born C1732. Died 23.4.1800 Masham. Sister of John b.1734. REBECCA HARRISON. Born 1829 Stainmoor.Kirkby Malzeard. Dau of James & Sarah Cundall. Servant Park St. Ripon in 1851. RICHARD HARRISON. Born C1818 Coverdale. Farmer at Low Sowermire, Healey. Married to Hannah of Healey. [Ref 1871 census]. RICHARD HARRISON. Born 1868 Grewelthorpe. Son of Matthias & Mary. Farmer at Kexmoor. ROBERT HARRISON. Bap 24.10.1819 Aldfield. son of Robert & Elizabeth of Lindricks. ROBERT PRESCOTT HARRISON. Born C.1822. Buried 6.10.1887. Lived High Bank Mickley. ROBERT CUNDALL HARRISON. Born 1827 Kirkby Malzeard. Died 1870 Kirkby Malzeard. Cattle dealer & Jobber. Son of James & Sarah Cundall. ROBERT HARRISON. Born 1834. Son of William & Alice. Brother of Matthias. ROBERT LEVI HARRISON. Born C.1872 Lancs. Son of Henry Barker Harrison & Sarah Slater. ROBERT WILLIAM HARRISON. Born Oct 23.1918. Buried 27.11.1985. M.I. Son of Thomas & Mary. Lived at The Nook. Grewelthorpe. SAMUEL HARRISON. Born C. 1830 Winksley. Bobbin Turner. married to Elizabeth born Kirkby Malzeard in 1833. Living at Queenshead Inn, Winksley in 1861. SAMUEL HARRISON. Born 1832 Carlton, Coverdale. Son of Henry & Mary Ann. SARAH HARRISON. Born C. 1846 Winksley. Dau of Joseph [stonemason] & Mary. SARAH ELIZABETH HARRISON. Born 1870 Easingwold. Dau of Joseph & Hannah. SARAH HARRISON [nee?]. Born 23 April 1876. A widow living Long Swales Kirkby Malzeard in 1939. SARAH MARY ELIZABETH HARRISON. Born C.1885.Buried 11.11.1930. M.I. Wife of Fred. SOPHIA HARRISON. Bap. 2.4.1848 Kirkby Malzeard. Dau of William [The Blacksmith] & Margaret. SUSAN ELIZABETH HARRISON. Born C.1821. Buried 25.6.1874 Mickley. THOMAS HARISON. Bap. 16.12.1602 Ripon Cathedral Son of George of Grantley. THOMAS HARRISON. Born C. 1811 at Sutton under Whitestone Cliff. Husband of Jane. Farmer Grewelthorpe. possibly the same Thomas as the following entry. THOMAS HANLEY HARRISON. Born C.1812. Yeoman of Grewelthorpe. Buried 8.3.1879 Mickley. Son of Henry & Ann Steward. Married Jane Pickard. of Grewelthorpe, dau of William Pickard. a Carpenter in Grewelthorpe. on 4.1.1844 at Kirkby Malzeard church. THOMAS DALTON HARRISON. Born C.1817 Aldborough. Buried 26.2.1874 Mickley. He was a clergyman. Married Elizabeth McRobb [or MacRobb]. She was Canadian. orphaned and raised by Sir Robert Barrie & Lady Julia Ingilby. Had dau. Frances G. & sons Ernest R.W.Harrison & Cecil D. Harrison. THOMAS HARRISON. Born C.1826 Carlton in Coverdale. Buried 30.9.1904. M.I. Husband of Elizabeth. THOMAS HARRISON. Bap 22.12.1839 Sugar Hill Kirkby Malzeard. Died/Buried 30.7.1840 Stainmoor, Kirkby Malzeard. Son of James & Sarah Cundall. THOMAS HARRISON. Born C.1856. Son of Thomas & Jane. THOMAS HARRISON. Born C. 1857. Greweltorpe. Buried 15.2.1879. son of Thomas & Elizabeth. M.I. Bramley Grange. THOMAS HARRISON. Born C.1858. Grewelthorpe. A servant in London in 1891. THOMAS HARRISON. Born 1 Feb. 1869. In 1939 a retired farmer foreman living The Green Sawley. A widower. THOMAS J. HARRISON. Born 14 Jan 1884. Married to Annie E. Contractors labourer living Bedale in 1939. THOMAS HARRISON. Born 18.6.1893. 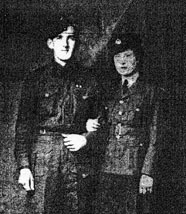 Buried 16.7.1954. son of William & Jane Metcalfe. of Bramley Grange. Started school 25.8.1879.Left 1880.1911 doing farm work on parents farm. unmarried. Husband of Mary. Lived Ivy House. Grewelthorpe. M.I. See Obit at end. WALTER HARRISON. Born C. 1867. Son of John [Farmer]& Isabella Calvert. WALTER HARRISON. Born C. 1892 Fryer Ings. Farm Lab. in 1911 working for John Barker. at Mallaby House, Dallowgill. WILLIAM HARRISON. Married in 1707 at Kirkby Malzeard to * Mary Atkinson. * of Hartwith. WILLIAM HARRISON. Bap 28.9.1766. Grewelthorpe.Son of Christopher. WILLIAM HARRISON. Born C1794. Died 1862. Married to Jane [b.1801] of Borobridge. In 1861 according to census Wm. was too infirm to work. WILLIAM HARRISON. Bap. 6.4.1817 Aldfield. Son of Robert & Elizabeth of Lindricks. WILLIAM HARRISON. Born C. 1823 Kirkby Malzeard. Blacksmith Kirkby Malzeard in 1861. married to Margaret b.1822. WILLIAM HARRISON. Born C. 1838 Carlton, Coverdale. Brother of Margaret & Jane. WILLIAM HARRISON. Born C. 1842 Winksley. Bobbin Turner. Son of Joseph [stonemason] & Mary. WILLIAM HARRISON. Bap. 8.3.1845 at Kirkby Malzeard. Son of Thomas [The Yeoman] & Jane of Grewelthorpe. Husband of Mary. Living Terrington with Wiganthorpe in 1891. WILLIAM HARRISON. Born C. 1849. Son of John [Farmer] & Isabella Calvert. WILLIAM HARRISON. Born 1861 Armley. Son of Matthias & Mary. Farmer at Kexmoor. Married to Louise of Masham. Lived Gill Head Farm, Swinton in 1901. WILLIAM HARRISON. Born C.1863 Carlton in Coverale. Buried 9.9.1917. M.I. Son of Thomas & Elizabeth. Husband of Jane Metcalfe. Married C 1887. Lived Bramley Grange. In 1911 had 3 children 1 of which had died. See photo of grave at end. WILLIAM HARRISON. Born C.1867 Kirkby Malzeard. Son of ? & Margaret. Blacksmith in 1891 in Kirkby Malzeard. WILLIAM T HARRISON. Born 10 March 1884. Widower Farmer at Throstle Nest Summerbridge in 1939. WILLIAM HENRY HARRISON. Born 2 Oct. 1885 Kirkby Malzeard. Son of Francis [Blacksmith] & Jane. Married to Doris C. [born 27.4.1897]. Master Blacksmith. WILLIAM HARRISON. Born 15 Sept. 1895. Married to Anne [born 1887]. He was a blind home worker. Living Oak Cottage Grewelthorpe. WILLIAM IANSON HARRISON. Born March 5th 1904. Son of R.Harrison of Braithwaite Hall, Galphay. Married Lily Waite. of Crosshills Grewelthorpe on 18th May 1929. Living Warren Lane Galphay in 1939. WILLIAM HARRISON. Born C. 1920. Brother of Henry & Margaret Harrison. Son of Thomas & Mary of The Nook, Grewelthorpe. Obituary of Thomas Harrison. 1893-1954. Reported in Ripon Gazette July 1954. The death occurred last week of Mr. Thomas Harrison. of Ivy House, Grewelthorpe. late of The Nook, Bramley Grange. 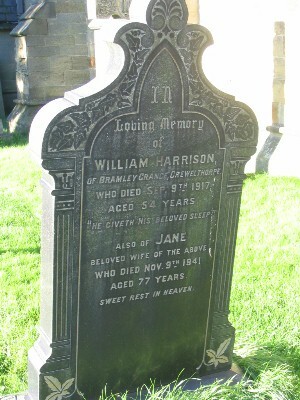 Aged 61, Mr Harrison was the only son of the late Mr & Mrs W.Harrison, of Bramley Grange. He retired to Grewelthorpe about 3 years ago after farming at The Nook. He took an active part in the life of the village and will be much missed, especially at the Methodist Church, where he was a trustee and a Society steward. He was a member of the Kirkby Malzeard branch of the National Farmers Union, the War Agricultural Executive Committee [Ripon District] and Grewelthorpe Parish Council. The funeral which was largely attended took place at Grewelthorpe Methodist Church on Tuesday [16.7.1954]. Rev T.W.Ellenor conducted the service, assisted by Pastor Hymer. Mr George Lofthouse. was organist. Mr & Mrs W,Harrison [son & Dau in law]. Mr & Mrs H.Harrison [son & dau in law]. Misses Doreen & Margaret Harrison. [Daughters]. Mr & Mrs H. I’Anson & Mrs Mackey. [Nieces]. Mr T.H.Richmond [nephew] & Mrs Richmond. Grave of William & Jane Harrison in Grewelthorpe Churchyard. Wedding of Sapper H.Harrison [RE] and ACWI F.Lodge. [WAAF] in Grewelthorpe 1944.